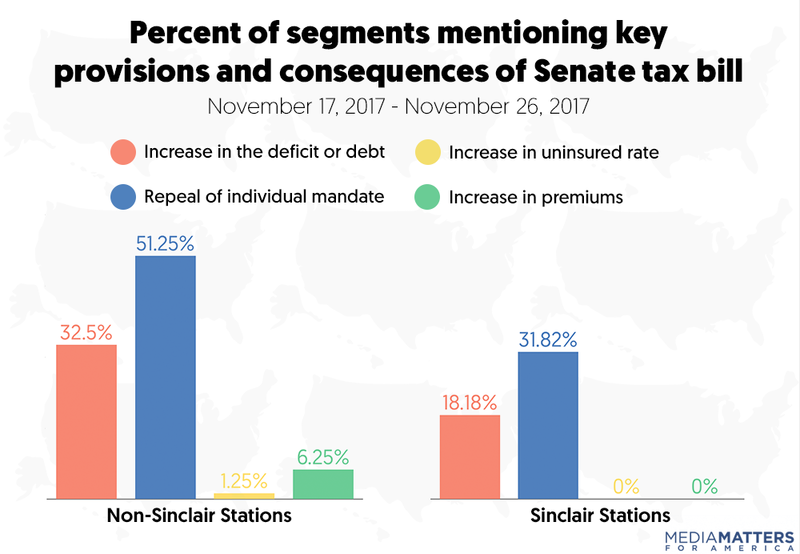 found that key provisions of the tax bill put forth by Senate Republicans were all but omitted from local media coverage of the plan in Portland, ME; Phoenix, AZ; Madison, WI; Anchorage, AK; and Nashville, TN. Additionally, while local media widely reported that the bill would repeal the Affordable Care Act’s (ACA) individual mandate, they neglected to note that doing so would raise premiums and increase the number of uninsured people. Sinclair Broadcasting is close to accepting a remedy proposed by President Trump’s Department of Justice to allow its $6.6 billion buyout of Tribune Media to gain regulatory approval, The Post has learned. The feds want Sinclair, whose 193 TV stations spread over 89 markets makes it the largest TV station owner in the country, to sell 13 Tribune stations, sources said. Sinclair is hoping to get that number down to 10 stations, sources said — but is ready to accept the Justice Dept.’s offer to get the deal done. Local television news does a poor job of keeping us informed. Pro-Trump Sinclair Broadcasting's growth will only make that worse.